We provide quantitative insight in the spatial distribution of the future supply of wood as a raw material from European forests (27 countries) until 2060. This supply is tested for two scenarios: ‘projection of historical management’ and ‘new management trends’ and compared against a benchmark scenario. The new management trends scenario incorporates influences of issues as nature-oriented management, carbon credits and increased demand for bio-energy. 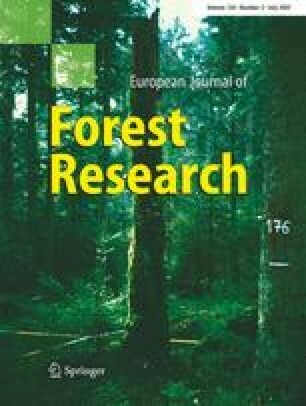 The results of these projections provide insight in the state of the European forests and indicate that under the ‘new management trends’ supply can still increase to 729 million m3 by 2060 in Europe, whereby almost throughout Europe we allow harvest to be higher than increment for some time. Without linking countries dynamically through international trade, we identify regions where harvesting pressure is highest. Under the new management trends scenario, the harvested volume is reduced with 82 million m3/year (compared to ‘projection of historical management’) because of stricter management constraints. However, the management regimes as parameterised here allow harvesting pressure to remain highest in Central Europe and some Scandinavian countries, notably Finland and Norway. This paper is partly based on a study commissioned by the CEPI in Brussels. We want to thank the steering committee at CEPI that guided the project. In the finishing stages, the work was supported under the EU funded FP6 EFORWOOD-IP project (contract 518128). Furthermore, we are greatly indebted to the country data correspondents who provided the forest inventory data. Without them these analyses are impossible. These are: Albania, Dr Eng. Bashkim Mal Lushaj; Austria, Dr Klemens Schadauer; Belarus, Mr Mikhail V. Kuzmenkov; Belgium, Wallony, Prof. J. Rondeux, Flanders: Mr Bart Roelandt; Bulgaria, Dr Stefan Mirchev, Croatia, Dr Goran Kovac, Czech Republic, Dr Miloš Kraus; Denmark, Dr Kim Dralle; Estonia, Mr Ulo Viilup; Finland, Prof. Erkki Tomppo; France, Dr G. Pignard; Germany, Mr Peter Lohner; Greece, Dr I Meliadis; Hungary, Dr Peter Csoka; Ireland, Cormack Judge; Italy, Dr Franco Cozza; Latvia, Sanda Zauere. Lithuania, Edmundas Petraukas; Luxembourg, Mr Marc Wagner; Macedonia, Mr Luktscho Nesterovski; the Netherlands, Ir. H. Schoonderwoerd; Norway, Mr S.M. Tomter; Poland, Mr Roman Michalak; Portugal, Mr Antonio Leite; Romania, Mr Claudiu Zaharescu; Russia, Mr Valentin V. Strakhov; Slovakia, Mr Ivan Luptak; Slovenia, Dr Hocevar; Spain, Dr J.A. Villanueva; Sweden, Dr U. Söderberg; Switzerland, Dr U.-B. Brändli; Ukraine, Vladimir F Romanovsky and Dr Igor Buksha; Turkey, Mr Ulvius; UK, Mr Simon Gillam; Yugoslavia, Mr Milan Medarevic. The data update part of the study was done in collaboration with Volker Sasse at UN-ECE Timber Committee in Geneva under the EFSOS programme.